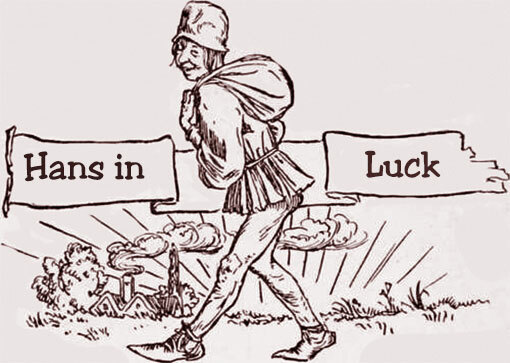 Some men are born to good luck: all they do or try to do comes right-- all that falls to them is so much gain--all their geese are swans--all their cards are trumps--toss them which way you will, they will always, like poor puss, alight upon their legs, and only move on so much the faster. The world may very likely not always think of them as they think of themselves, but what care they for the world? what can it know about the matter? One of these lucky beings was neighbour Hans. Seven long years he had worked hard for his master. At last he said, 'Master, my time is up; I must go home and see my poor mother once more: so pray pay me my wages and let me go.' And the master said, 'You have been a faithful and good servant, Hans, so your pay shall be handsome.' Then he gave him a lump of silver as big as his head. A fig for the morrow! After a time he thought he should like to go a little faster, so he smacked his lips and cried 'Jip!' Away went the horse full gallop; and before Hans knew what he was about, he was thrown off, and lay on his back by the road-side. His horse would have ran off, if a shepherd who was coming by, driving a cow, had not stopped it. Hans soon came to himself, and got upon his legs again, sadly vexed, and said to the shepherd, 'This riding is no joke, when a man has the luck to get upon a beast like this that stumbles and flings him off as if it would break his neck. However, I'm off now once for all: I like your cow now a great deal better than this smart beast that played me this trick, and has spoiled my best coat, you see, in this puddle; which, by the by, smells not very like a nosegay. One can walk along at one's leisure behind that cow--keep good company, and have milk, butter, and cheese, every day, into the bargain. What would I give to have such a prize!' 'Well,' said the shepherd, 'if you are so fond of her, I will change my cow for your horse; I like to do good to my neighbours, even though I lose by it myself.' 'Done!' said Hans, merrily. 'What a noble heart that good man has!' thought he. Then the shepherd jumped upon the horse, wished Hans and the cow good morning, and away he rode. Hans brushed his coat, wiped his face and hands, rested a while, and then drove off his cow quietly, and thought his bargain a very lucky one. 'If I have only a piece of bread (and I certainly shall always be able to get that), I can, whenever I like, eat my butter and cheese with it; and when I am thirsty I can milk my cow and drink the milk: and what can I wish for more?' When he came to an inn, he halted, ate up all his bread, and gave away his last penny for a glass of beer. When he had rested himself he set off again, driving his cow towards his mother's village. But the heat grew greater as soon as noon came on, till at last, as he found himself on a wide heath that would take him more than an hour to cross, he began to be so hot and parched that his tongue clave to the roof of his mouth. 'I can find a cure for this,' thought he; 'now I will milk my cow and quench my thirst': so he tied her to the stump of a tree, and held his leathern cap to milk into; but not a drop was to be had. Who would have thought that this cow, which was to bring him milk and butter and cheese, was all that time utterly dry? Hans had not thought of looking to that. While he was trying his luck in milking, and managing the matter very clumsily, the uneasy beast began to think him very troublesome; and at last gave him such a kick on the head as knocked him down; and there he lay a long while senseless. Luckily a butcher soon came by, driving a pig in a wheelbarrow. 'What is the matter with you, my man?' said the butcher, as he helped him up. Hans told him what had happened, how he was dry, and wanted to milk his cow, but found the cow was dry too. Then the butcher gave him a flask of ale, saying, 'There, drink and refresh yourself; your cow will give you no milk: don't you see she is an old beast, good for nothing but the slaughter-house?' 'Alas, alas!' said Hans, 'who would have thought it? What a shame to take my horse, and give me only a dry cow! If I kill her, what will she be good for? I hate cow-beef; it is not tender enough for me. If it were a pig now --like that fat gentleman you are driving along at his ease--one could do something with it; it would at any rate make sausages.' 'Well,' said the butcher, 'I don't like to say no, when one is asked to do a kind, neighbourly thing. To please you I will change, and give you my fine fat pig for the cow.' 'Heaven reward you for your kindness and self-denial!' said Hans, as he gave the butcher the cow; and taking the pig off the wheel-barrow, drove it away, holding it by the string that was tied to its leg. So on he jogged, and all seemed now to go right with him: he had met with some misfortunes, to be sure; but he was now well repaid for all. How could it be otherwise with such a travelling companion as he had at last got? Meantime he began to be tired, and hungry too, for he had given away his last penny in his joy at getting the cow. At last he could go no farther, for the stone tired him sadly: and he dragged himself to the side of a river, that he might take a drink of water, and rest a while. So he laid the stone carefully by his side on the bank: but, as he stooped down to drink, he forgot it, pushed it a little, and down it rolled, plump into the stream. For a while he watched it sinking in the deep clear water; then sprang up and danced for joy, and again fell upon his knees and thanked Heaven, with tears in his eyes, for its kindness in taking away his only plague, the ugly heavy stone. 'How happy am I!' cried he; 'nobody was ever so lucky as I.' Then up he got with a light heart, free from all his troubles, and walked on till he reached his mother's house, and told her how very easy the road to good luck was.